Dub-Eye clash royale clash royale tutorial Trending Video Games Clash Royale Double the Crown Chest rewards! Clash Royale Double the Crown Chest rewards! According to SuperCell they are adjusting the Tournament Rules and doubling your Crown Chest rewards! 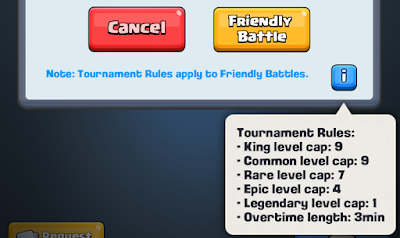 Following on from our last post, "Competition and Clash Royale", we wanted to further explainwhy Tournament Rules exist in their current form, and what's changing soon. That's the why, and now to talk a little bit about the how: We started with the lowest common denominator, Legendary Card level 1, and worked upwards from there, taking into account the relative power levels of each card rarity. However, after playing with the Tournament Rules for some time now, we've realised that we undershot the comparative strength of the Legendary Cards by a little bit. To help players get to the Tournament Rules more quickly, and considering that we're planning to increase the levels in the next update, we wanted to bring two cool new things at the same time! Firstly, we're going to DOUBLE the rewards inside every Crown Chest. This will make grinding out those Crowns and unlocking your daily Crown Chest even more worthwhile - twice as much, in fact! Secondly, we're revamping the card donation and request system so that it improves as you reach higher Arenas. For example, in the Royal Arena you'll be able to request 30 Common Cards or 3 Rare Cards at a time!